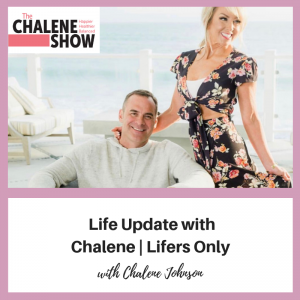 Join Chalene for a life update (cough* cough* Lifers only)! Get all the deets on what’s been happening in Chalene’s life as of late. In addition, you’ll get filled in on some exciting projects and events coming up in the near future. You don’t wanna miss this one! We want you to share your messages with us through Speakpipe! Every Friday CarSmart, we will be featuring one message we have received at the beginning of the episode (as we did in this episode)! If you want a chance for your message to be heard by all TCS listeners, then send us a message today and test your luck! You can let us know how this show has impacted or shaped your life… OR you can share with us what you’d like to hear more about in the future. You can send a message through Speakpipe at the bottom of this post! Can’t wait to hear from my lifers.